Featured Condo › How much can landlords ask for? How much can landlords ask for? How much can landlords ask for in this renter’s market? Private apartment rents slipped another 0.3 per cent in July, SRX Property data showed. Since their peak in January 2013, private apartment rents have fallen 12.5 per cent, as the market has clearly shifted in favour of renters with landlords facing increasing competition from new supply amid decreasing demand. The downward pressure on rents will continue as long as the current market dynamics prevail. At this point, there is no sign that rental supply will tighten any time soon. In fact, urban planners expect more than 40,000 private apartments to come on the market by the end of next year, giving more options for renters and hurting landlords. On the demand side, there are fewer renters as a result of tighter immigration rules. In addition, expatriates are taking advantage of surplus supply to negotiate lower rents or downsize to less expensive rentals. The history of expatriate housing budgets is that employers had been forced to provide lavish packages in emerging markets to lure employees to leave their home countries. The lease is put in the firm’s name to protect the employee from dodgy tenancy laws. As the market evolves into a first-class economy, it is difficult for multinational firms to wind down housing budgets because they have set a precedent. Employers find that they cannot cut the packages without a good excuse. In Singapore, multinationals were trying to roll back housing budgets long before the 2008 global financial crisis, as the city-state is hardly a hardship post and the rule of law here is strong. The financial crisis gave multinational managers a good excuse to cut housing benefits here. Subscribing to the axiom “Never let a good crisis go to waste”, many firms used the financial crisis to cut generous housing packages and shift responsibility for accommodation to the expatriate employee. Since it is a wait-and-see situation with respect to the Government’s immigration policy and it is unlikely that employers will return to the pre-financial crisis go-go years of lavish expatriate housing budgets, do not hold your breath that demand and rents will pick up in the near future. The current market dynamics has significant ramifications for landlords’ negotiating power and rental income. The balance of power has shifted to renters, who have the upper hand in negotiations because they have plenty of other rentals from which to choose. In a down market, landlords have to reduce rents or leave the rental homes unoccupied until the uninitiated comes along and pays the full price. Both lead to a decline in rental income. Anecdotal evidence from renters in recent focus groups suggested that some landlords had tried to resist market forces. However, these same renters said they later received SMS messages from the agents of these landlords telling them the rents had been lowered. It is very difficult to go against the market. 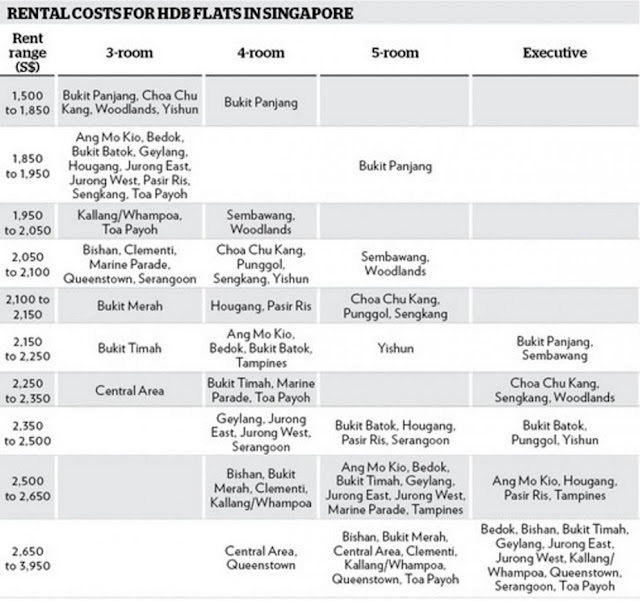 To help market participants gain an understanding of rental costs across Singapore, SRX Property has put together two tables: One for HDB flats and the other for private apartments. Each table shows what properties one can rent at various price points. 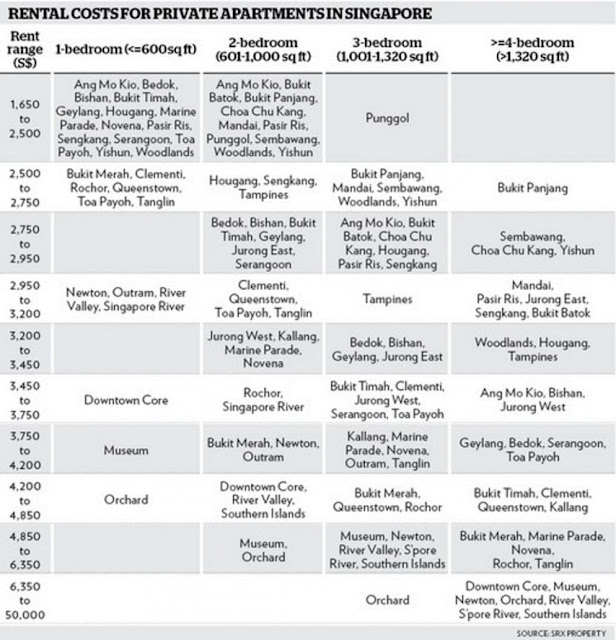 For example, if your rental budget is S$2,000 per month, you can rent a 3-room HDB flat in Kallang/Whampoa or Tampines or a 4-room unit in Sembawang or Woodlands. From the private apartment table, you will see that the same S$2,000 gets you a 1-bedroom apartment up to 600 sq ft in Ang Mo Kio. For the same price, you can rent a 2-bedroom apartment up to 1,000 sq ft in Pasir Ris. Regardless of the type of property attainable from a housing budget, today’s rental market favours the tenant in price negotiations. It is a renter’s market. Don’t be surprised if prices continue to fall as more supply comes into the market and more tenants pressure landlords for lower rents.